Jason Cummings struck 16 minutes from time to earn leaders Hibernian a 1-1 Ladbrokes Championship draw with Ayr at Easter Road. 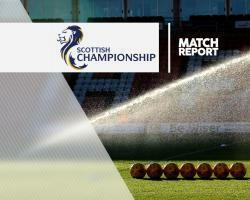 James Keatings dragged an early effort wide for the hosts before the Honest Men went ahead in the fourth minute after Robbie Crawford beat three Hibs defenders before firing a shot past Ross Laidlaw. Keatings almost pulled Hibs level in the 27th minute but Greg Fleming got down low to turn his free-kick around the post. Andrew Shinnie then headed a Fraser Fyvie cross narrowly over as Hibernian began to enjoy the bulk of possession. Darren McGregor and Fyvie fired efforts narrowly over after the break before Hibs got a deserved equaliser when Cummings got on the end of a Keatings cross to flick a header past Fleming.